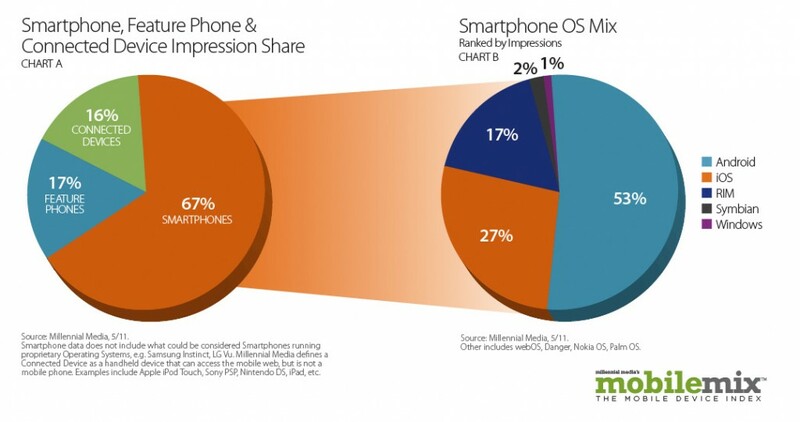 Some new figures on the state of the smartphone market for you to take a butchers at! This time it's Millenial Media, a market research company funnily enough, that has offered up the data. The data is based upon ad impressions for each platform, which are then used to reflect the market share each platform holds. Ok let's get into the figures then! In April of this year the lead platform was Android with 53% of the market, which should come as little surprise really. iOS dropped 1%, but Windows Phone rose 0.5% to grab its first full 1% of market share. Are those two statistics related? It certainly appears likely. RIM, increasingly lauded as the 'sick man' of the smartphone world, managed to cling on to a 17% share. Symbian ... well Symbian's prospects are about as good as Tyrannosuarus Rex's were on the eve of a the Baptistina asteroid impact.